When a small electrical charge is put through a polymer layer in a sunroof, the particles arrange themselves in a vertical orientation, letting light pass through mostly unencumbered. But when the charge is cut via a switch on the windshield header, the particles rotate 45 degrees, blocking most of the light and heat trying to pass through. Mercedes-Benz has introduced the "magic sky control" roof on the revamped SLK roadster, which went on sale in Germany for 38,675 euros earlier this year. The electrochromatic roof section is offered as one of three versions of the SLK's retractable hardtop. The others are solid steel panels and a tinted roof section above the cockpit. 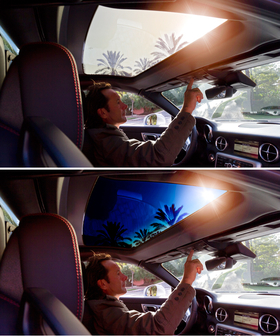 The "magic sky control" roof's transparent panel can vary its tint from almost clear to heavily darkened. The option costs 2,368 euros in Germany. The panel is a glass-matrix polymer-glass sandwich holding a thin layer of liquid in which small rectangular particles are suspended. Research Frontiers Inc. of Woodbury, New York, holds the patent on the technology that already is used in other industries, including aviation, aerospace and architecture. Here's how the roof changes tint: When a small electrical charge is put through the polymer layer, the particles arrange themselves in a vertical orientation, letting light pass through mostly unencumbered. But when the charge is cut via a switch on the windshield header, the particles rotate 45 degrees, blocking most of the light and heat trying to pass through. The shift requires only a moment. Pilkington Automotive, a unit of Nippon Sheet Glass Co. of Tokyo, supplies the roof panel to Mercedes. The panel uses an electrochromatic film layer produced by Hitachi Chemical Co. of Tokyo. Sources in Stuttgart would not name other models slated to receive the technology. But Mercedes in the past has debuted technologies on the SLK that later filtered into cars in the lineup. One example is Mercedes' so-called "air scarf" technology. Air scarf is a heating system that blows warm air out the top of the seat cushion. The warm air is directed at the occupants' necks to keep them warm when the top is down on cool days. That technology debuted on the SLK and then rolled out to the SL roadster and E-class cabriolet.